Our Chemistry App has been updated to a three-book series for kids, teens, and adults. Here is a chronicle of what we have learned. 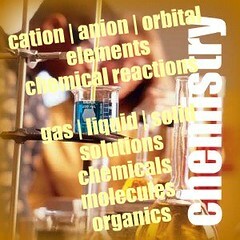 Kids Chem - 150 terms in 5 chapters, appropriate for middle school learners. 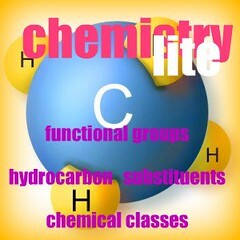 Chemistry - Over 600 terms in over 10 chapters, appropriate for high school learners. Chem AP: The Advanced Placement book has over 1,200 terms in 14 chapters targeting AP learners in high school, college learners, and what the UK calls A learners. The above concept-map categorizes the critical parts and process at the top; and stable objects at the bottom for the entire chemistry collection. Does one picture replace a thousand terms? Hydrocarbons are parts with only hydrogen and carbon as parts. Classes of hydrocarbons vary according to electron bonding. Substituents are classes of compound parts, the simplest of which is a hydrogen atom. Substituents bond with hydrocarbons to create classes of chemicals. Each hydrocarbon and substituent pair results in a new compound with consistent names. There is considerable confusion in the use of the term functional group. Among thousands of pages, Wikipedia volunteers, scientists, academics, and textbook authors seem to use the term to mean any of the above terms. The IUPAC definition seems to favor the strict use of functional groups to mean substituents. To avoid confusion for learners, we emphasize hydrocarbons, substitutents, and classes - rather than the unclear use of the term functional groups. Nevertheless, the IUPAC naming convention brings order to a complex subject where millions of compounds demand their own name. Chemistry is the simplest of the sciences, requiring rudimentary knowledge of algebra and simple formula writing. But, the rich subject matter impacts every aspect of life - including metals, rocks, chemicals, plastics, technology, and biochemistry. Millions of professionals work to improve life by exploring and innovating with chemicals. Millions more need to join the effort to discover new knowledge. This three-book chem-series serves as another beginning for that journey.